Special Collections is well-equipped with six PCs across the counter in which library users may conduct online database searching (including HKU online public access catalogue and World Wide Web), of which two can be used for viewing standalone CD-ROMs as well. To make copies of books or journals, one may proceed to the Photocopying Room where three photocopying machines are provided, or to make use of a handy high resolution colour scanner for quick scanning. 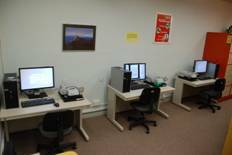 As for viewing/scanning the microform materials, the Microform Room is equipped with six compact digital microform viewer/scanners.